The neutral to mildly alkaline soils in much of Illinois can make it difficult to grow acid-loving blueberries (Vaccinium spp.) in most parts of the state. 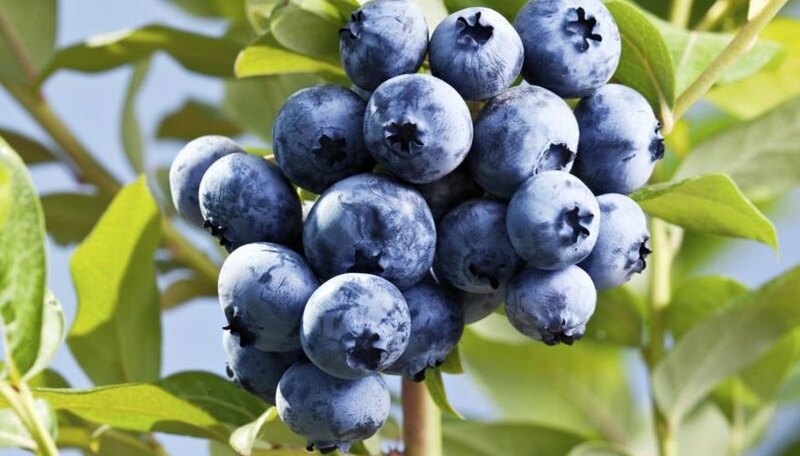 However, ambitious gardeners who are willing to put effort into improving and maintaining their soil may be able to coax a blueberry harvest out of their Illinois gardens. The most challenging aspect of growing blueberries is the plant's demand for soil within a very specific pH range. Blueberries need acidic soil with a pH between 4.8 and 5.2, and soils in that range are uncommon in Illinois. Some soils in extreme southern Illinois are nearly acidic enough, but much of east central and northeast Illinois has soils with pH levels far too high to allow blueberries to grow well. If your soil's pH is neutral to slightly acidic, it may be possible to lower its pH sufficiently with amendments. To lower the pH of sandy soil by one point, mix in 1/2 to 3/4 pound of sulfur per 100 square feet of planting area. Increase the amount to 1 to 1 1/2 pounds for loamy soil and 1 1/2 to 2 pounds for clay soil. If your soil is mildly alkaline, it's probably better to plant bushes in raised beds filled with an acidic soil mixture. The best types of blueberry to grow in Illinois include northern highbush blueberries (Vaccinium corymbosum) and half-high bushes (Vaccinium corymbosum x Vaccinium angustifolium), which are hybrids of highbush and lowbush (Vaccinium angustifolium) varieties. Northern highbush and half-high types are generally hardy in U.S. Department of Agriculture plant hardiness zones 3 to 7 and should do well in all parts of the state. USDA hardiness zones in Illinois range from an area of USDA zone 4 in the north, around Rockford, to USDA zone 6 in the south, roughly from Alton southward; the rest of the state falls into USDA zone 5. Northern highbush cultivars well-suited to the temperature ranges of the Illinois climate include "Patriot" and "Northland," which are hardy in USDA zones 3 to 7, and "Bluecrop," "Bluejay," "Jersey" and "Elliott," which are hardy in USDA zones 4 to 7. Blueberries like well-drained soil that's rich in organic matter. They have shallow root systems and won't tolerate standing water or soggy soils. Plants should get about an inch of water per week under normal conditions and up to 2 inches per week during periods of drought. The bushes prefer full sun; although they will tolerate some shade, they will likely not produce well unless they get sun through much of the day. Plant bushes in the early spring, spacing plants 4 to 6 feet apart. Annual fertilization with ammonium sulfate will provide nitrogen for the bushes and help to acidify the soil over time; apply 3 ounces in a ring about a foot from the base of the plant in the second and third years after planting. Increase the amount to 8 ounces in the fourth year and 12 ounces in the eighth year and beyond. Apply the fertilizer in early spring before the plant resumes growth.